Without West Coast glitz, East Coast bustle, Southern charm, or even Midwest nice, the American Plains could easily be the country's most overlooked region. More than cornfields and truck stops sandwiched between Iowa and the Rocky Mountains, the Great Plains encompass parts of 10 states and stretch from Montana down to New Mexico. And they're full of beauty and adventure, just as long as you know where to get off US 80. 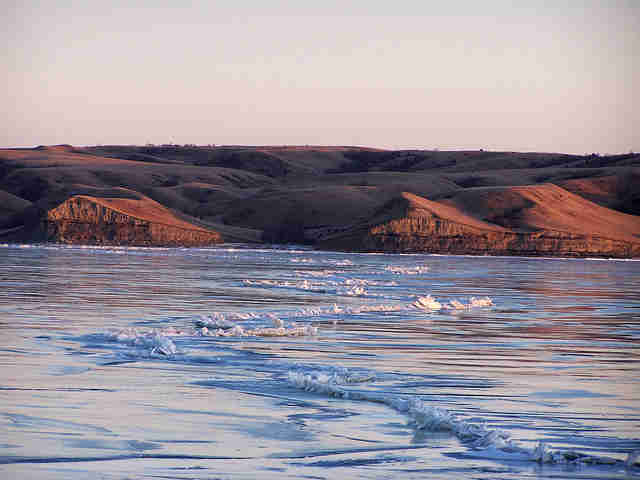 When one thinks of the unforgiving landscape of barren North Dakota, water is not the first thing that typically springs to mind. Yet overlooked in America's obsession with freaky Fargo and frigid International Falls is this beautiful expanse of lakes that combines creepy otherworldly rock structures with a full-on boat party. Or salmon-fishing party, if that’s how you roll. The one must-do thing: The park is also the western terminus of the 4,600-mile North Country National Scenic Trail, so if you've always wanted to hike across the country to New York, this is your starting point. 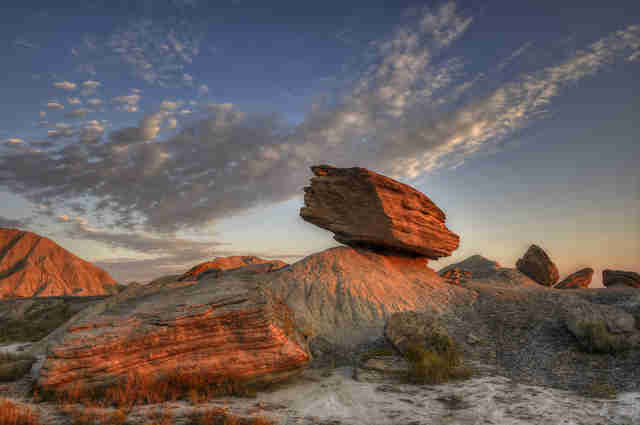 These deserted red-and-grey moonscapes (a stark stretch some people call the "Badlands of Nebraska") will instantly push aside your preconceived notions of the state's cornfields. Only thing: you got to want it, as the park can only be accessed via a rough 30-minute drive on bumpy dirt and gravel roads. The one must-do thing: Take a side trip to Alliance, Nebraska, and its weird roadside attraction at Carhenge. Yes, it's exactly what it sounds like -- a Stonehenge made of junk cars. If there's any doubt this serene escape in Southwest Oklahoma is the land time forgot, one gander at the 650-or-so bison wandering the area should quickly take you back about 500 million years (which is about how old these mountains are). 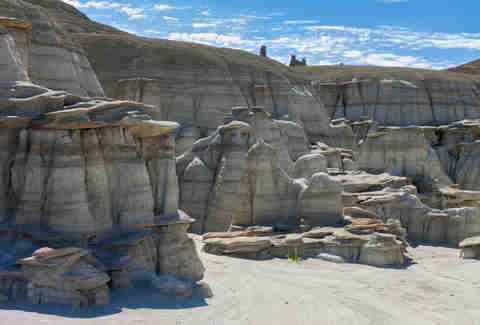 Proving grass prairie doesn't have to be boring, it also showcases stunning rock formations and hundreds of cool plant and bird species. 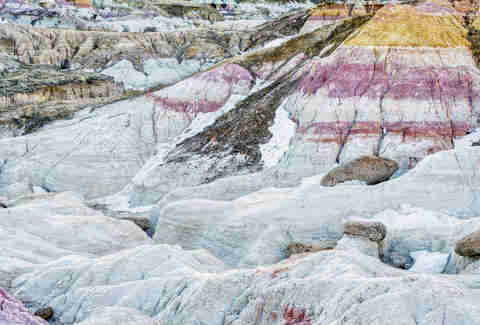 What would have happened if Bob Ross had gone on a psychedelic bender in the remote Eastern Colorado plains and went mad with the paintbrush on some trippy (and happy) rock formations? Besides excellent television, the results would probably look something like this stunning expanse of bright color and rock about an hour outside of Colorado Springs. The one must-do thing: Wander the four miles of trails that spread out over 750 acres and marvel at the picturesque pinks, yellows, and snow-white spires. Hopefully you packed your paintbrush and easel. 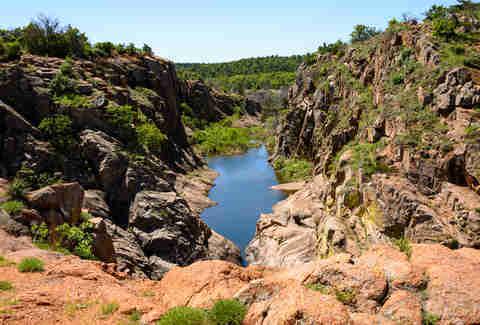 The Texas Panhandle is rockin' some seriously surprising beauty thanks to places like this 120-mile canyon, the second longest in the country after the Grand Canyon. 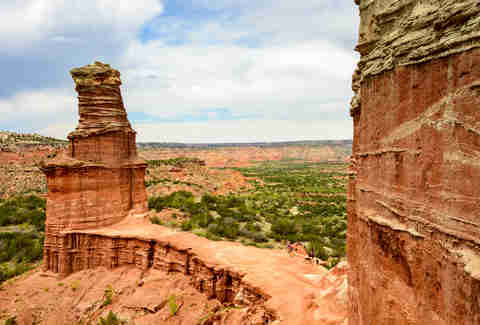 The park packs in some deep reds and brilliant hues that give Southern Utah a run for its money, plus there are really cool cabins built in historic brick huts that you can rent. 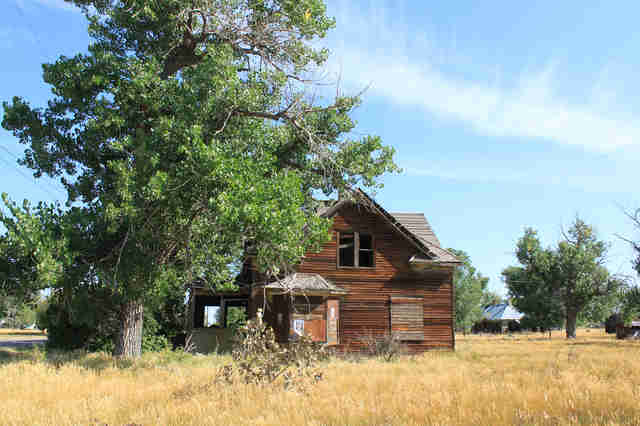 While South Dakota is packed with tourist hotspots like Mount Rushmore, the Badlands, Black Hills, and the surprisingly happening party town of Deadwood, you don't have to travel too far off the beaten path to discover this ghost town tucked away in the southwest corner of the state. And it's a true ghost town... as in no one lives here. No one. The one must-do thing: Explore the dozen-or-so remaining abandoned houses and take plenty of photos of rusted-out junkers. Feel free to call squatter's rights. Montana's largest state park might not be as famous as places like Glacier, but it's still the finest spot in Big Sky Country to mingle with dinosaur fossils. And the best part? You can mingle with said fossils buried within the state's far eastern plains any time of day, as the park never closes. Also, you can play disc golf at all hours of the night in total wilderness. The one must-do thing: You mean besides playing disc golf at all hours of the night? 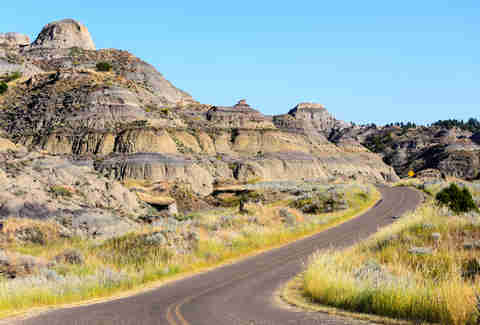 Try the Kinney Coulee Trail and go off path to make your own adventure. 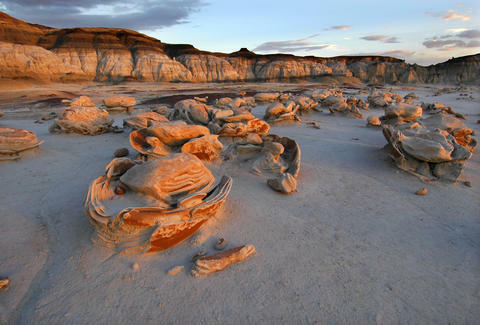 While Wyoming is known for the jagged Tetons and erupting geysers of the northwest part of the state, the flatlands that dominate much of its landscape come into full focus at this eye-popping collection of 1.4 billion-year-old rock formations. 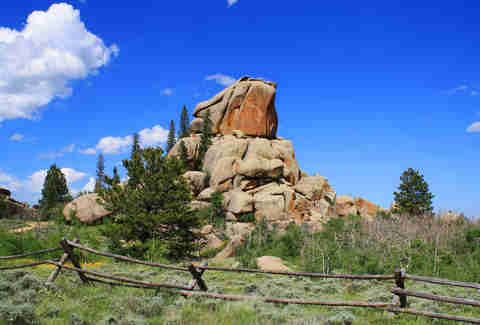 Located within the Medicine Bow-Routt National Forest, America’s answer to Stonehenge also boasts plenty of sleepy campsites off remote forest service roads. The one must-do thing: Rock climbing! That's right, this area is one of the world's most renowned places to scale boulders for a reason -- there are over 900 climbs to explore throughout its Sherman granite nooks and crannies. 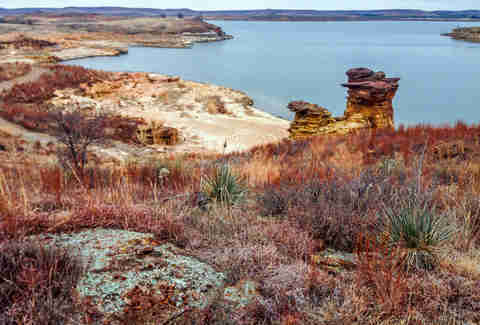 With 9,000 acres of water surface and 100 miles of picturesque shoreline, the man-made (by the US Army Corps of Engineers) Wilson Lake comes out of nowhere to shock you with its beauty and red-rock outcroppings. You can fish, water ski, play sand volleyball, or mountain bike. And yes, this is Kansas. The rolling landscape of badlands and weird rocks in this remote Four Corners outpost in the high desert of New Mexico’s San Juan Basin is no less than a stunning sight to behold. There are no trails. There are no bathrooms. There is no snack bar. It's just you and the elements out here, plus maybe a sporadic golden eagle or hawk. The one must-do thing: Besides bring plenty of water? Take the two-mile hike to Rock Garden at sunrise and watch it light up with life as dawn breaks. 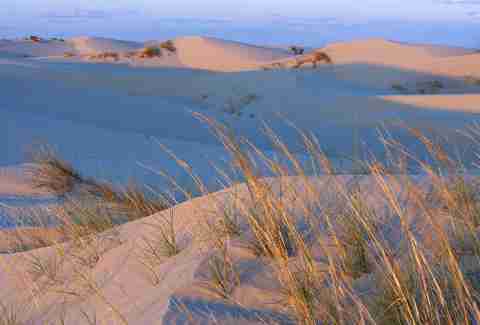 Some of the country's most beautiful sand dunes hide out within this far-flung section of West Texas flatlands, some rising up to 70ft above its wind-swept plains. You can recreate scenes from Dune, lay out on a blanket and bake in the sun, or ride horses in the 800-acre equestrian area. The one must-do thing: Going all John Wayne on horseback is great and all, but if you find yourself sans horse you can rent sand toboggans at the visitor center and sand surf wherever the hell you damn well please. OK, so obviously not one of the aforementioned 10 states, but some people consider Idaho part of the Plains. 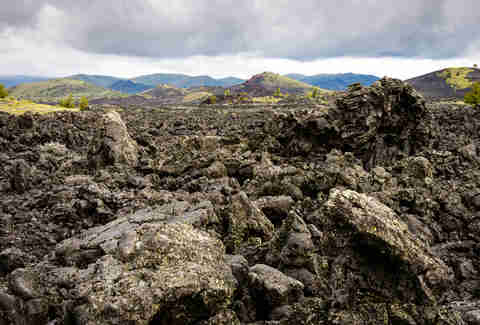 And Craters of the Moon is absolutely worth a mention. Made up of three massive lava fields within Central Idaho's Snake River Basin, this rugged landscape of volcanic cones and sagebrush grasslands also boasts an impressive backcountry for all your hiking and camping adventures. Jay Gentile is a Thrillist contributor and he always plays disc golf in remote state parks. Follow him: @innerviewmag.